Back in 2004, email looked a lot different than it does today. Inboxes were overtaken by spam, and there was no easy way to search your inbox or file messages away. Plus, you had to constantly delete emails to stay under the storage limit. We built Gmail to address these problems, and it’s grown into a product that 1.5 billion users rely on to get things done every day. Today, on Gmail’s 15 birthday, we’re taking a look back and sharing where we’re headed next. 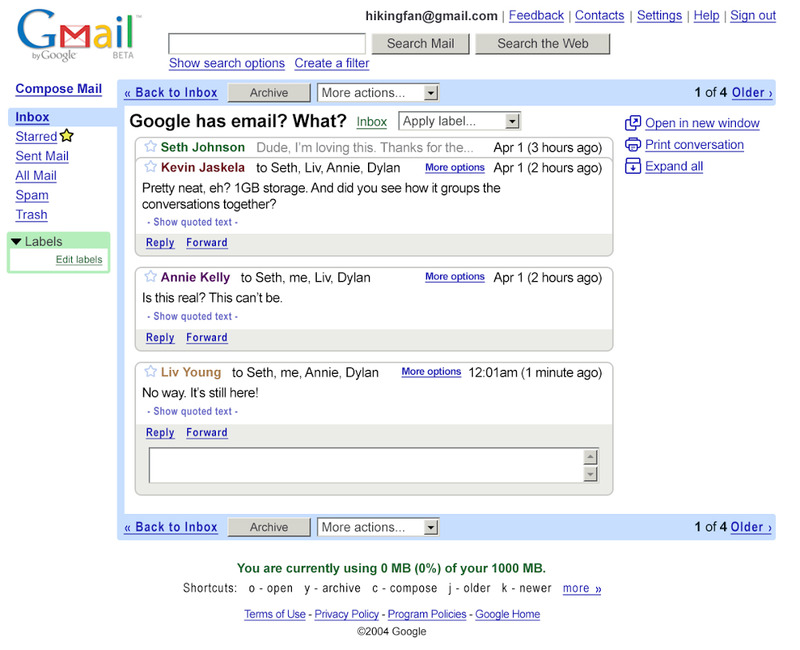 On April 1, 2004 we launched Gmail (despite the timing, not a joke). It had the power of Google Search built right in and grouped your messages into conversation threads, making it easier to find and reply to them. You could also store 1GB of data for free—nearly 100 times what was available at the time. No wonder the world thought it was a prank. In the mid-2000s, email spam was a serious issue. Gmail blocked spam before it ever reached your inbox, and created a way for people to report suspected spam when they saw it, to help make email safer. Over the years, we’ve enhanced our spam filtering capabilities with artificial intelligence and today, AI helps us block nearly 10 million spam emails every minute. Here's a throwback video from 2007 where our team explains how Gmail fights spam. When Gmail launched, the first Android-powered smartphones were still years away. As mobile devices became ubiquitous, Gmail evolved from being desktop-only to also work on your phone or tablet, helping you get more done on the go. Gmail's tabbed inbox feature was the first of its kind, helping you organize messages by category, so you can see what’s new at a glance. AI-powered features like Smart Reply and Nudges helped you reply faster and stay on top of your to-dos. Gmail has evolved a lot over the past 15 years. Before we blow out our birthday candles, here’s a rundown of new features coming your way. First off, we’re making Gmail more assistive. You may have already used Smart Compose, an AI-powered feature that helps you write emails quicker. It’s already saved people from typing over 1 billion characters each week—that’s enough to fill the pages of 1,000 copies of "Lord of the Rings.” Today, we’re updating Smart Compose to include more languages (Spanish, French, Italian and Portuguese) and bringing it to Android (previously, it was only available on Pixel 3 devices), with iOS coming soon. Smart Compose is also getting, well, smarter. It will personalize suggestions for you, so if you prefer saying “Ahoy," or “Ello, mate” in your greetings, Smart Compose will suggest just that. It can also suggest a subject line based on the email you’ve written. Lastly, you can now take action without leaving your inbox. You can respond to a comment thread in Google Docs, browse hotel recommendations and more, directly within emails. This way you don’t have to open a new tab or app to get things done.